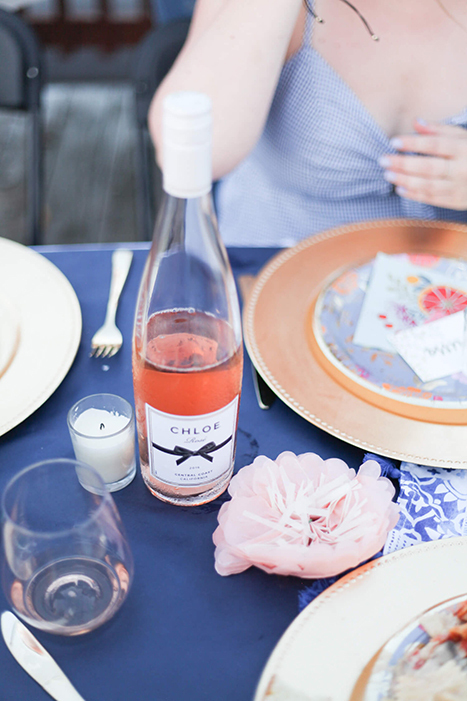 We’re in the final stretch of summer, and we wanted to give our friend, Love Always, Audrey a first look at our endless summer collection for her rooftop dinner party with friends. 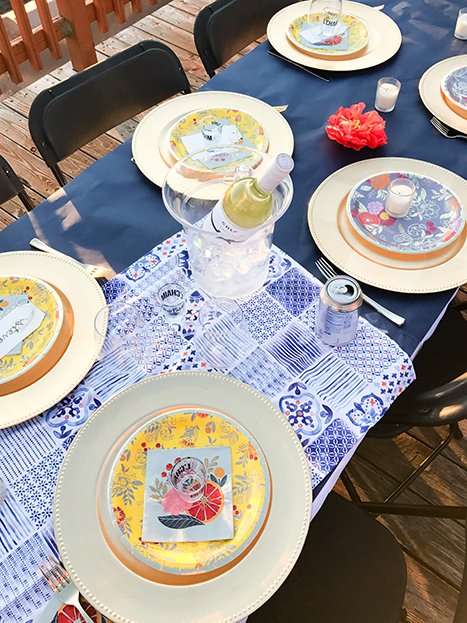 We were so excited to see how she used our products to create a stunning al fresco scene, and how she decorated her table with place cards, wine openers and more! 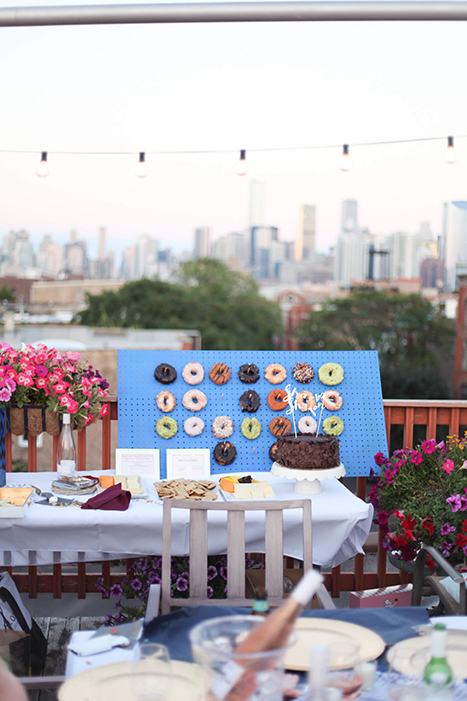 She also constructed her very own donut wall…which is just about the coolest thing ever. Here’s Audrey! I don’t know about you all, but I am not excited for summer to be over… not one bit. 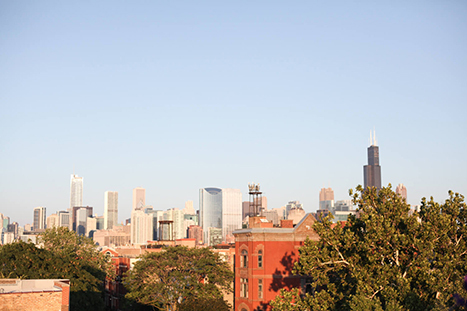 I love fall, but summer in Chicago is truly the most exciting time and I am getting so sad about it ending. 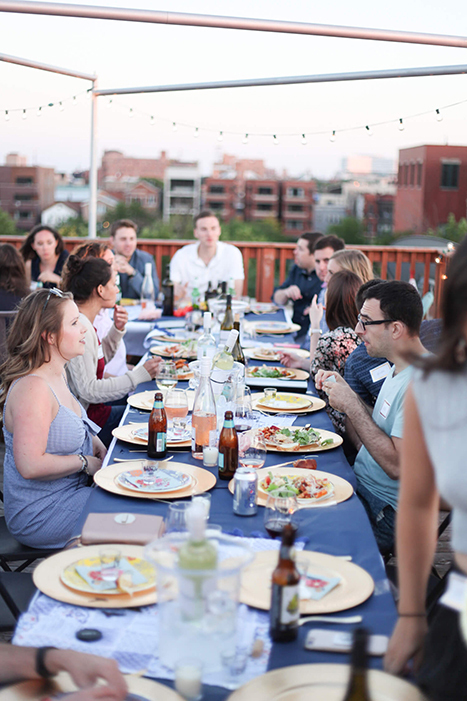 In an effort to soak up what’s left of #SummertimeChi, I put together a seated rooftop dinner for 30 people (friends and friends of friends). 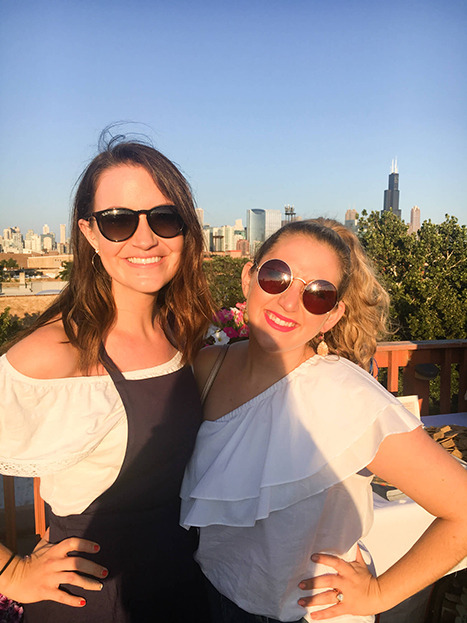 It ended up being the most perfect evening – the weather was great, the wine was flowing, and the ambiance was on point. As per usual, I sourced all of my decorations from Paper Source. To say I love their Endless Summer collection would be an understatement. Everything in it is so gorgeous – the colors are fantastic and I love all of the citrus and floral graphics! Everything in the collection complements each other so nicely, doesn’t it? 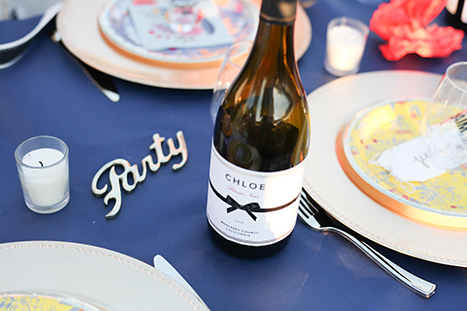 When people walked into the dinner party, they saw a string of place cards and name tags with their names already on them (which I unfortunately didn’t get a picture of). I put the place card in front, and then used a mini clothespin to attach a name tag for them as well! And then I used the same clothespin to fasten them to the string. I then had everyone put their place card where they wanted to sit for the evening so they could save their seat while mingling. 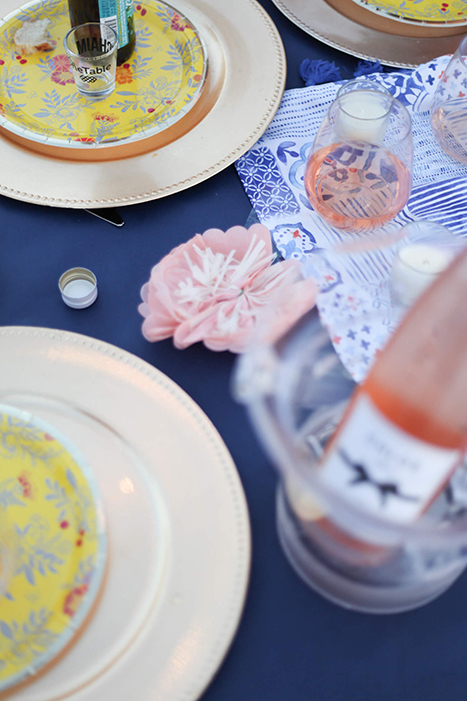 I taped these coral paper flowers to the table and they looked so cute next to the cocktail plates, dinner plates, and napkins. One thing I really recommend putting on the dinner table at home and at parties is a set of Table Topics. It’s a pack of cards that asks fun questions for you to discuss as a group – it’s a great way to get meaningful conversations going! 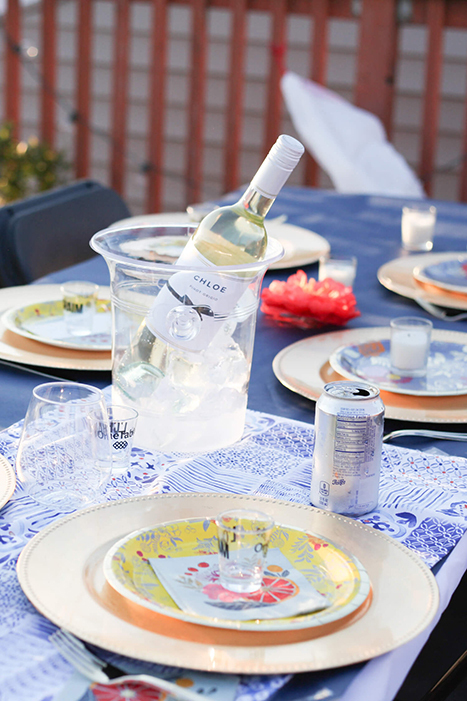 I used these blue tile tea towels (say that 10 times fast) to add a little more color and texture to the table. I love the tassels at the end of them! I also put down blue wrapping paper on top of the white tablecloths for a few reasons: a) it looked pretty and b) people spilled wine on the paper instead of my tablecloths. Win win! This little “party” bottle opener is like a sneaky, multi-functional piece of decor. everything really well! Visit this post for instructions on how to make it (it’s super easy). The big chocolate cake came from Costco and is honestly one of my favorite desserts of all time. It always reminds me of Matilda and every time I see it, “you must eat the entire confection!” comes into my head. Anyone else? Bruce! Bruce! Bruce! 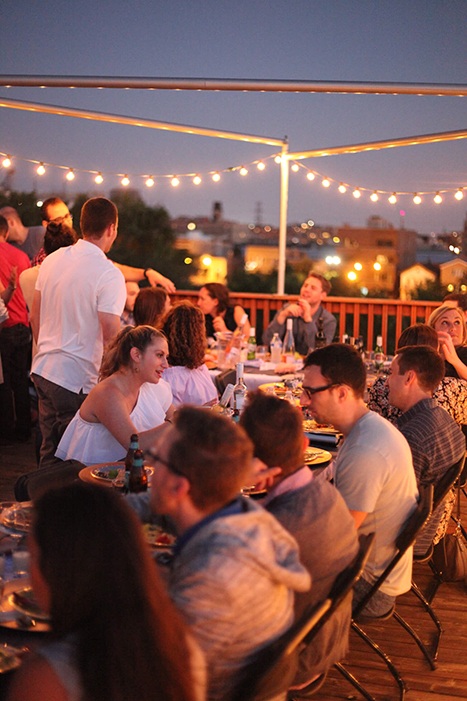 I loved celebrating an endless summer with this rooftop dinner. 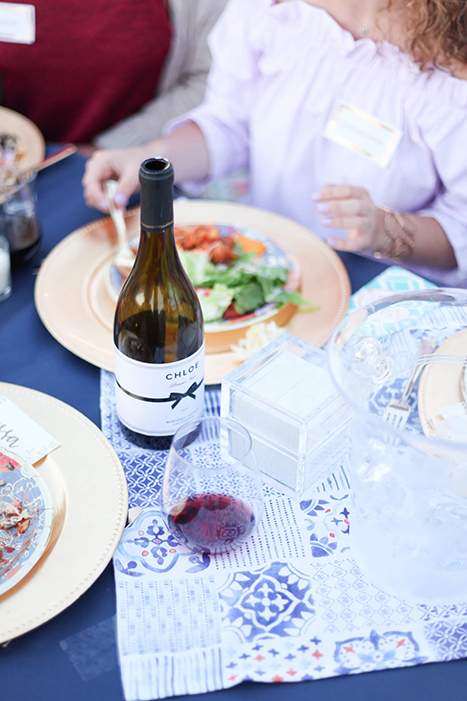 Seated meals with people you love are just the best, aren’t they?